Cloud computing is beneficial to all sizes and type of organizations, however by nature of the services it is especially so for small to medium size businesses. The opportunity to easily and quickly acquire enterprise class IT services, minimize the up-front financial and on-going operational investments, plus many other benefits that provide flexibility and agility to better meet current and changing business needs is the promise of cloud computing. Cloud computing offers greater choices and benefits but can be difficult to understand for the layperson so greater understanding is needed in order to properly implement and capitalize on the benefits, as well as ensure the user is aware of what they are actually buying. 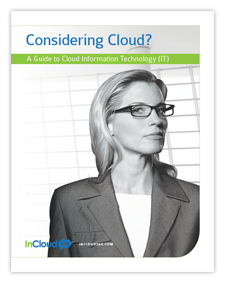 This Guide addresses cloud computing, mainly software as a service (SaaS), in terms of the most significant benefits for the small to medium size business. The goal is to help owners, executives and others understand cloud computing and the potential benefits in preparation for evaluating service providers. Simply fill out the form below and you will be redirected to the guide.